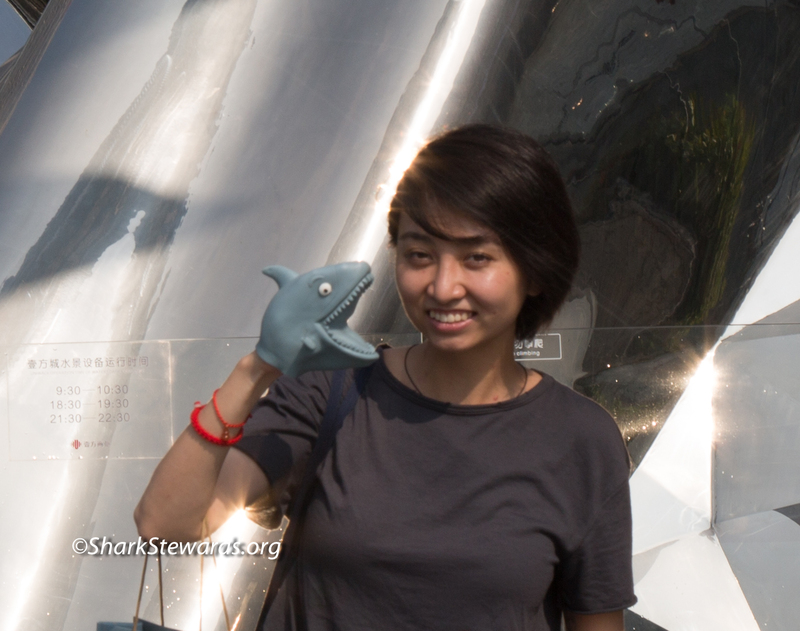 Shark Stewards is back from China meeting with youth and ocean leaders to catalyze a shark and ocean revolution. For 3 weeks, I traveled through mainland China and Hong Kong, including the shark fin capital of Guangzhou, meeting, documenting and learning how to save sharks at the endpoint of the global shark fin trade. Over 100 million sharks are being killed for the shark fin trade each year, and over 90% ends up in China. Bringing the shark love. 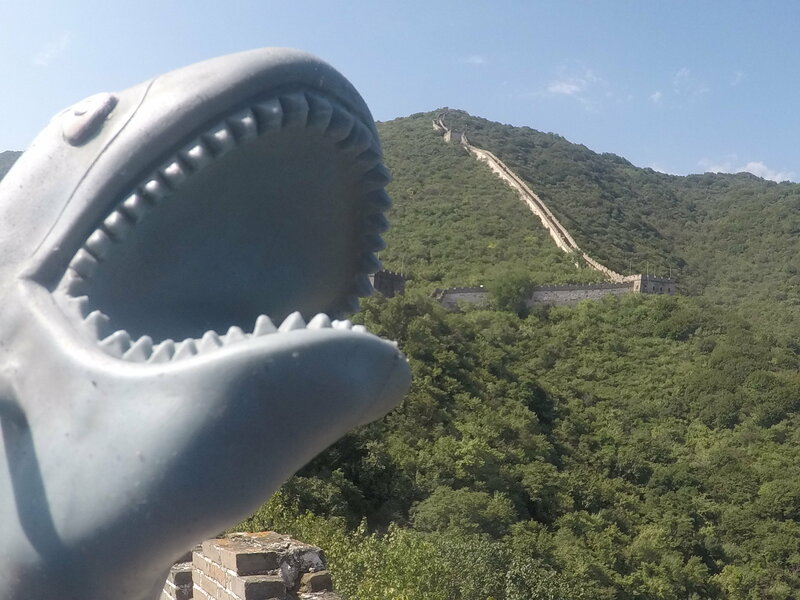 This unnamed shark accompanied me to China, with cameos at the Great Wall, at fin mongers and with Chinese youth catalyzing a blue revolution. We are planning an ocean festival in China in 2019 and making a short film about the shark’s adventure in China. Enter the contest to name our shark and win a trip to the Farallon Islands for Sharktober! If you are in the Bay Area, join us for one of our Sharktober Events this fall where we will reveal the name. The bill to protect global sharks from the fin trade in the US has been sent back to the Senate committee. This summer we visited several members of Congress including sponsor Senator Cory Booker to update and appeal for increased support of theFederal Shark Fin Trade Elimination Act HR1453/S.793 and supporting our Marine National Monuments by voting no on HR 3990- Utah’s Rep. Bishop’s bid to strip the Antiquities Act and the protection of our National Monuments. CONTACT YOUR LEGISLATOR.
. The Aquatic Park Stewards program is an ongoing program educating youth and engaging the community on Bay ecosystems and species, and collecting data in a long-term study of terrestrial and marine sources of marine plastic pollution, while actively supporting the San Francisco Maritime National Historical Park. In summer we used the Trident ROV to Borneo as part of our National Geographic Open Explorer project searching for nocturnal sharks and monitoring coral reefs. This fall we are using the Trident to monitor California Marine Protected Areas with the Golden Gate MPA Collaborative. Follow the expeditions documenting sharks using the mini ROV on Catalina Island and habitat in our Golden Gate MPAs, or join us this fall for Farallon Island Expeditions. This exciting new tool is allowing scientists and educators to discover and share our ocean experiences and increase data collection in our marine protected areas. 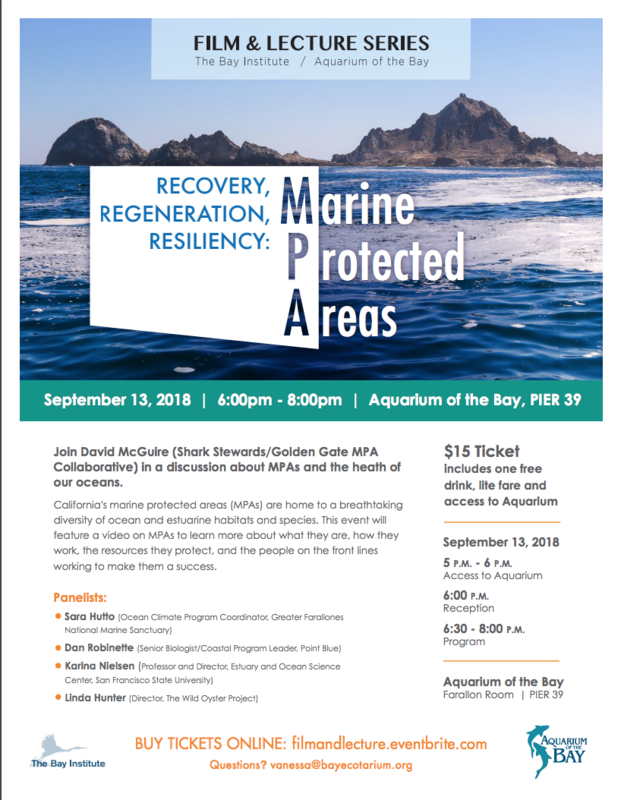 September 13, 2018 RECOVERY, REGENERATION AND RESILIENCY: MARINE PROTECTED AREAS AND CLIMATE CHANGE San Francisco Aquarium of the Bay, California. Access to Aquarium 6:00-6:30PM Reception 6:30 Film and panel 7:00PM-8:00PM Hosted by David McGuire, Director Shark Stewards, Co-Chair Golden Gate MPA Collaborative. September 15 Coastal Cleanup Day Shark Stewards and the Aquarium of the Bay are hosting a cleanup at Aquatic Park, San Francisco 9:00AM-12:00PM. Link to the Event. September 20 Can Diving With Sharks Save Them? 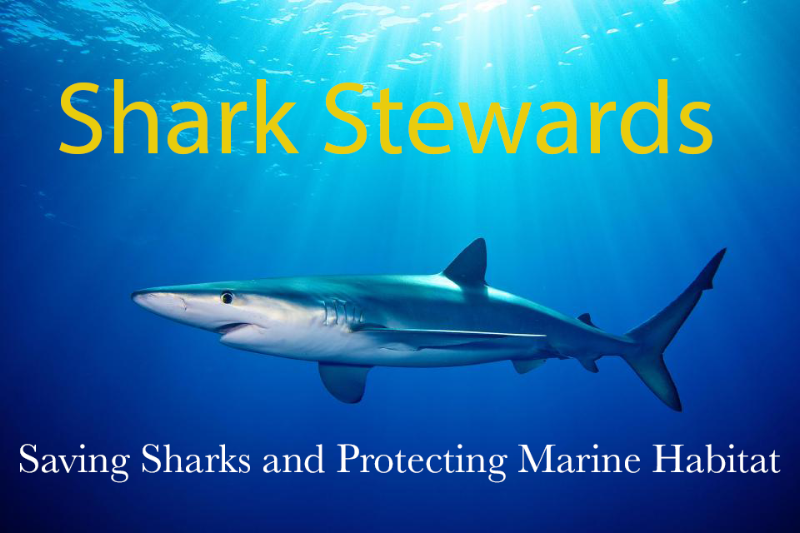 Talk and film by Shark Stewards David McGuire. Hosted by Marin SCUBA Club 6:30PM Reception and event at Book Passage, Corta Madera. September 29 | 11am-4pm Sharktoberfest at the Sanctuary Join the Greater Farallones National Marine Sanctuary, Shark Stewards and other shark and ocean lovers to celebrate he shark, sanctuaries and MPAs. This year we are featuring outreach and an exercise on our local MPAs. 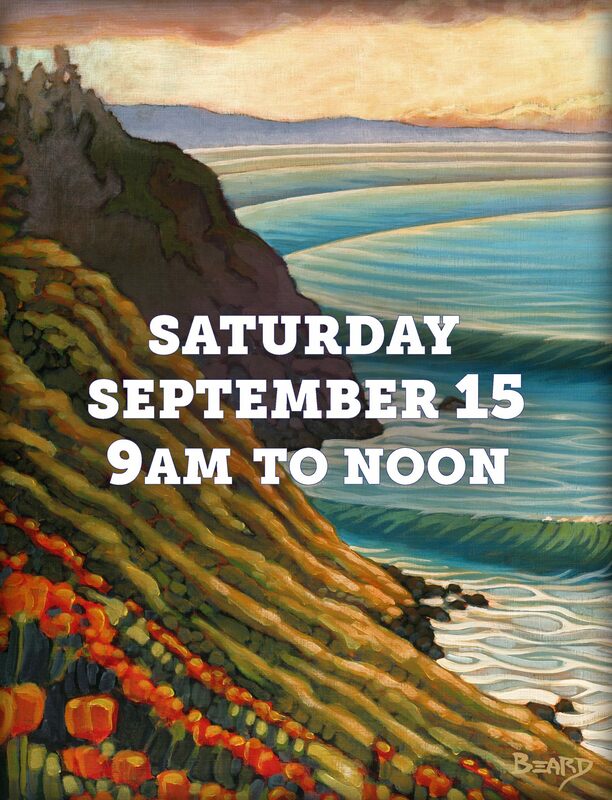 Join us at NOAA Greater Farallones National Marine Sanctuary (Headquarters) 991 Marine Drive, The Presidio San Francisco, CA 94129 Volunteers and Sponsors needed! SHARKTOBER Check our events calendar for our upcoming events in October. Travel and fieldwork are expensive. Your donations go to on the ground advocacy and engagement protecting sharks and the ocean. 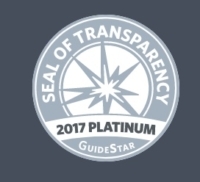 Thank you for supporting sharks and marine protection Shark Stewards is a 5 star, Platinum ranked charity and a proud project of the Earth Island Institute. Copyright © 2018 Shark Stewards, All rights reserved.